Home / Aesthetic Clinic / New Cutis Clinic Location Soon! We are excited to announce that we are moving! To serve you better with even more space, we are moving to a new clinic. 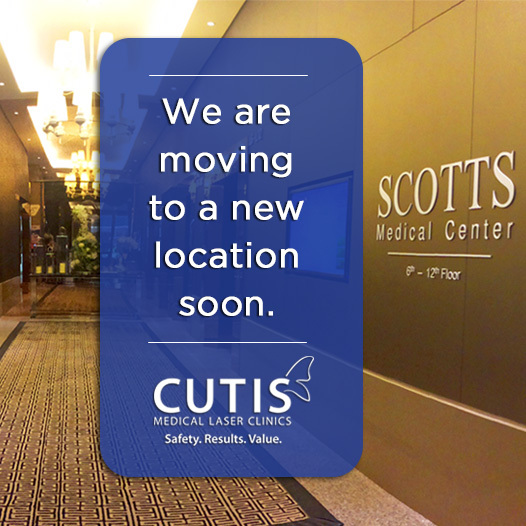 Our new Cutis clinic location is in Scotts Medical Suites, which is still located at Pacific Plaza. Cutis Medical Laser Clinics, a medical aesthetic and age management in Singapore, is based on the fundamentals of evidence-based treatments. We specialize in Botulinum Toxin (or more commonly known as Botox), Facial Fillers, Laser and IPL Treatments, Medical-Grade Facials and the Optimagenics Age Management Program. Their latest addition is the Treatment to Transformation – a holistic approach in transforming the body that includes CoolSculpting Fat Freezing Procedure, TriLipo Fat Reduction Technology, Tanita body diagnostics and a nutrition consultation. Sign up here to receive more updates!